Here is the pic of whats needed with the part numbers. Now these part numbers have been superceded but if you give these numbers a Cummins Dealer can get you the correct pump. jhedge wrote: The piston lift pumps have been manufactured for Cummins by 4 or 5 companys over the years and Carter was probably the best (they were my favorite) but there probably isn't a whole lot of difference. 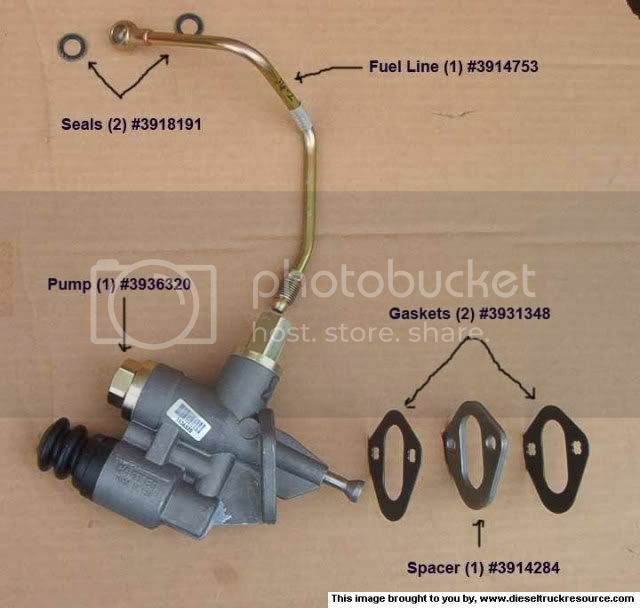 There is actually a family of pumps that were used on the B and C series in a bunch of different applications, some pumps were used on both engines and some were only used on one or the other but they all look basicly the same (this is why the B-Series engine gets a spacer between the block and the pump). There are around 7 pumps in the family and 4 of those are identified with a color coded dot, which will be either red, blue, green, or purple (Cummins called it "violet"). The dots moved around over the years, but they were always applied by the pump manufacturer and since Cummins paints the engine after it's assembled, you will only see the dot if you buy one as a replacement part (which are sold unpainted), if you pull it off another truck the paint dot trick doesn't work. I think some of the pumps did have the dot on the bottom of the primer boot, so those might show up after the engine was painted. All of the pumps have been revised over the years and received new part numbers 6 or 8 times. It will actually put out more pressure then that, max should be just about 15 psi. The 2nd gen dodge that used the P-pump had the lift pump with the blue dot, which is the same as the green dot except for the outlet fitting.